On Thursday, the SPARK Movement released a pie chart that revealed that over the past three years, the majority of Google Doodles featuring people on Google's homepage were of men. Responding swiftly, Google said they were aware of the issue and hoped to have men and women represented equally in 2014. In a post on the issue, SPARK's Celeste Montaño wrote that she found it interesting that she and others online were so inspired by the recent Google Doodle of Zora Neale Hurston. She speculated that "maybe it was special because it's one of the few times that the Internet saw Google honor a black woman on its front page. Maybe it was special because it's uncommon for Google to celebrate historical women of color." It's is about becoming visible in a society that erases our history and our existence; it's about acknowledging and celebrating our part in building this world. So we're asking Google to Doodle Us. Not the SPARK team specifically, but people like us: women, people of color, people with disabilities, queer people, trans people. We're asking Google to draw our histories, our achievements, our strength, our heroes, our fighters and foremothers. You can't keep ignoring us. We're here, and we've always been here. "Women have historically been underrepresented in almost all fields: science, school curricula, business, politics — and, sadly, doodles," Ryan Germick, Google's Doodle Team Lead, said via email. 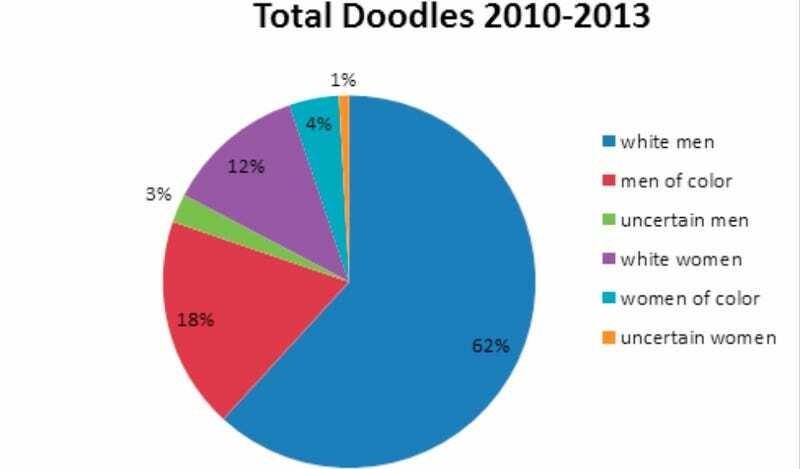 Germick said the company is hoping to have women and men equally represented in doodles in the coming year, and said it has made significant strides in the first two months of 2014. "So far this year we've done doodles for as many women as men, a big shift from figures below 20% in past years," he said. SPARK will continue to keep track of Google Doodles and make sure Google follows through. While this might seem like not such a big deal, the lack of diversity of something as small as a Google Doodle is relevant to the larger issue of women not being properly acknowledged as part of the tech world and in history at large. Visibility is also important: Google is an incredibly popular and powerful platform. Who knows how many people have clicked on a Doodle and learned something new about a person they didn't know existed before that moment? Even these small things have power.